Hey you guys. I made my very first video tutorial regarding my number one beauty secret on how to apply clip in hair extensions!! (Well, I guess it's not a secret anymore.) Lucky you, I like to share. Warning: These are very addictive. The reason to buy clip-in's is to add length, thickness (or both) to your hair. You don't need long hair to do this. You can very easily have short hair. Clip in hair extensions are affordable and for a good set, they run $75 and up. They will last you at least 6 months to a year. If not longer. Never buy synthetic hair. 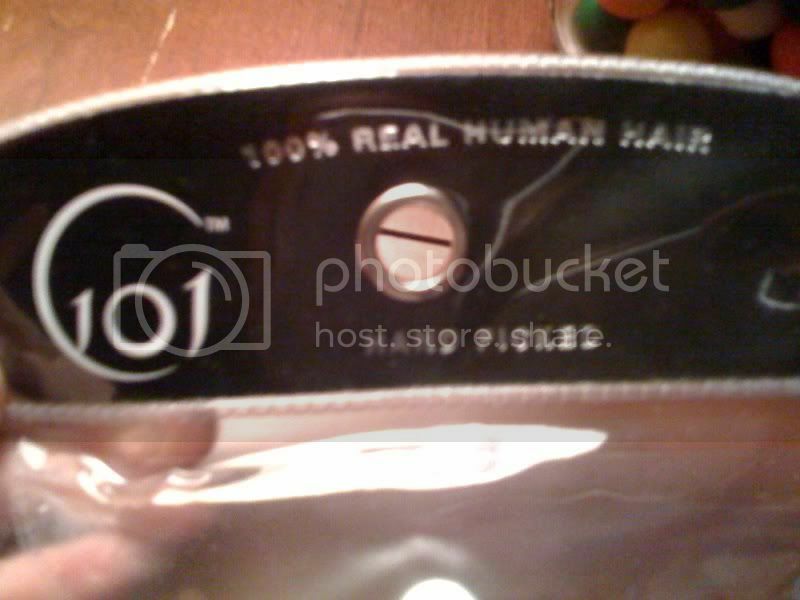 You only want 100% real human hair. It looks natural. Synthetic = Fake!! You can buy them at a beauty supply store, with the clips already sewn in. I go to Paradise Beauty in Arizona. Clip-Ins can be washed, cut, colored (but only darker not lighter), blown dry, flat-ironed, and curled! The color of your clip-ins does not have to match your own hair color exactly. You will be surprised how easily it will blend in with what you have. Clip-in's are a low-maintenance and easy alternative to permanent hair extensions, which can be extremely damaging to the roots and shaft of your hair over extensive periods of wear. 7 hair pieces come in a standard pack. There are three different sizes. To keep track of which goes where, mark little dots in the area of where the clips are with a sharpie. One dot for the clip that goes in at the nape of your neck. Two dots for the clip that goes in second. Three dots for the third clip. And for the four side clips, write R(one dot), R(two dots) and L(one dot) and L(two dots). Don't know what I'm talking about? Watch the video! If you have any other questions, please email me at runningonhappiness@gmail.com or leave a comment below and I'll try my best to answer them! I've been getting lots of questions as to what brand I use, the kind ini the video are made by Fashion Source. The description of these extensions is 'STW 7PCS 14" F6/613' Another great brand (which I don't know the exact name of but find a picture of it here). Bottom line, just find some clip ins that have a 7 piece set and are made of real human hair. I don't think you can go wrong! And i love your makeup! Flawless! Yous should do a post/or video on that! Have a great night darlin! I have a feeling you are right about them being addictive though. oh guess who used to wear clips in..uhm..every day? me. And then my hair got way too long and they stopped blending well. I miss them. i possibly giggled this entire video at your adorable accent- americans make me laugh! Clip in extensions always scared me a little, but now i can see they are actually do-able and you can brush them?!!! awesome!! Oh this is such a great video! I've been wanting to get some because my hair is in the in between stage of growing out long. Where is the best place to buy them from? you are inspiring and refreshing and wonderful :) thanks for making me smile on a frigid midwest Wednesday! Holy smoke they are SO perfect on you wowowow, I really want to get extensions, but the clip-ins won't work if I go to the beach/pool etc so I was kinda looking for the glue ones. I know I know, they're not THE best for hair but I saw some oil-based glues that aren't as damaging as other glues. Nothing my hair can't handle! Those extensions you have blend oh so perfectly with your hair. My main concern is that I have ombré hair and I don't want to get only BLONDE extensions but the color of yours look seriously PERFECT for my hair. I hope they have some like that at Sally's! Hope you don't mind if I email ya later with a billion questions but you kinda look like a pro. And oh.my.gosh you are gorgeousness. i used to wear these all the time when my hair was short!!!! i like the color you had it looked great with your real hair! katie! i can't find your email address anywhere.... im special sometimes haha... could you send your email to ashley.theshineproject@gmail.com ? I have a question for you! thankkkks love! Just came across your blog - it's AWESOME!! Oh wow, nice job with this!! I've tried to make how-to videos before but nothing turned out this good! LOVE it!! these extensions look great on you and really do blend into your hair perfectly. just wondering, what brand are your extensions? and you should definitely do more video tutorials! this is a great tutorial. I am addicted to clips in too. But my hair is longer than my clips now. Guess it's time to buy longer clips. Thank you for your sweet comment on my blog. I love your blog and I love reading your post. Love this! You have such a cute blog. I've always wanted to try clip ins just to see how theyd work out. Haha, thank you for such a sweet comment! I'm not a model at all haha I'm only 5'2''. But that's so sweet of you to say! : ) I'll definitely be back to your blog soon! Thank you so much for this video! I must try these! Do you suggest a specific brand? great video! very helpful if i ever decide to use extensions! Thanks for the tutorial! I'm interested in getting clip-in extensions... is there a particular brand that you like and would recommend? I have always wondered how people put these in their hair! Thanks for the helpful video! You're a natural in front of the camera! You should definitely do a makeup routine video. It looks gorgeous! These extensions look so natural. I've never been brave enough to try any! for being your first video it´s prefect!! well done, and the tutorial is very interesting. I used to wear clip-ins all.the.time! Except I made them lol I was broke so I bought hair and the clips and just sewed them together. They lasted a long time. My hair has grown out but I been thinking of making new ones. What's with the background panting noises? Is someone that excited by extensions. When I have my extensions in, it makes my head itch... I'm not sure if it's the particular kind of extensions I have or if it's normal? I know I'm behind on your blog but I was looking through your tutorials. Gosh you are beautiful. I am dying for extensions & you make them look perfect but everyone keeps telling me I'll look "hood" if I get them. I wish I could convince them. Oh well. Very cute video! This is a great tutorial for not all of us are aware how to apply clip on hair extensions and this will be helpful. Love the video! Thanks so much for sharing. Love the extensions!! Your hair looks great! But what is with the heavy breathing in the background?? LOL! The process of using hair extensions is really very easy.Thanks for this valuable information.keep sharing. Any kind of brand name selling any item is going to do far better whether or not they have any well-known encounter behind that. Granted, if replica Breguet watches you are well-known then one will simply fically her or himself along with brands which can be respected, well-known and may manage to pay effectively when getting the particular rights in order to plaster a famous confront close to what it is marketing, whether drinking replica Rado watches water (Jennifer Aniston regarding SmartWater), footwear (all those that get in some point backed Nike), and in this case, high-class designer watches. Luxurious high quality Replica Breitling Watches observe makes have all the actual attributes that best replica Patek Philippe watches organize them in a replica Louis Vuitton Handbags position so that you can pay for the (normally) money that they do to types of superstars. Very creative and professional tutorial for graphic designer, also for me. Find the best and quality selection of brazilian human hair extensions here at glamourweave.com. Love your blog so much, please keep your post continue. you look adorable.It is a great tutorial.I would be glad to see this type of constructive tutorial again.